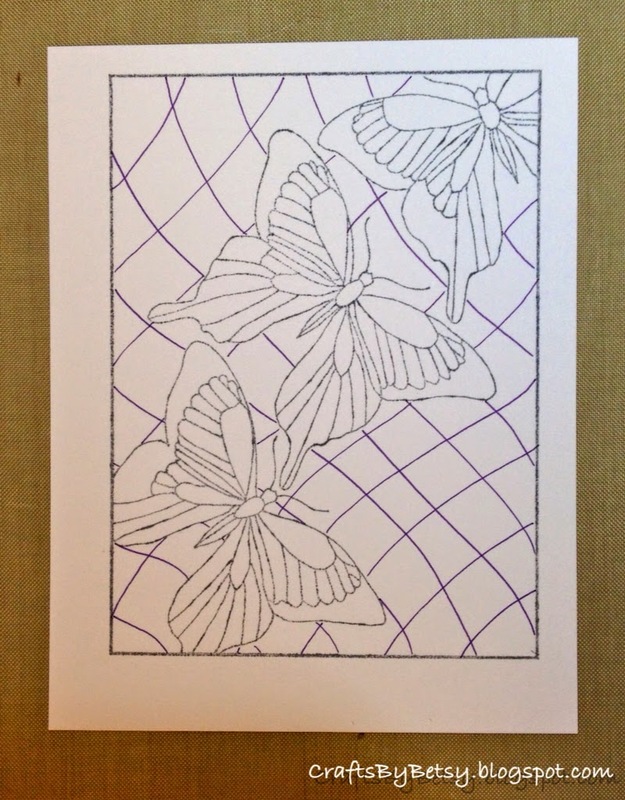 This is an example of combining rubber stamping with Zentangle®. For another example, check out this earlier post. 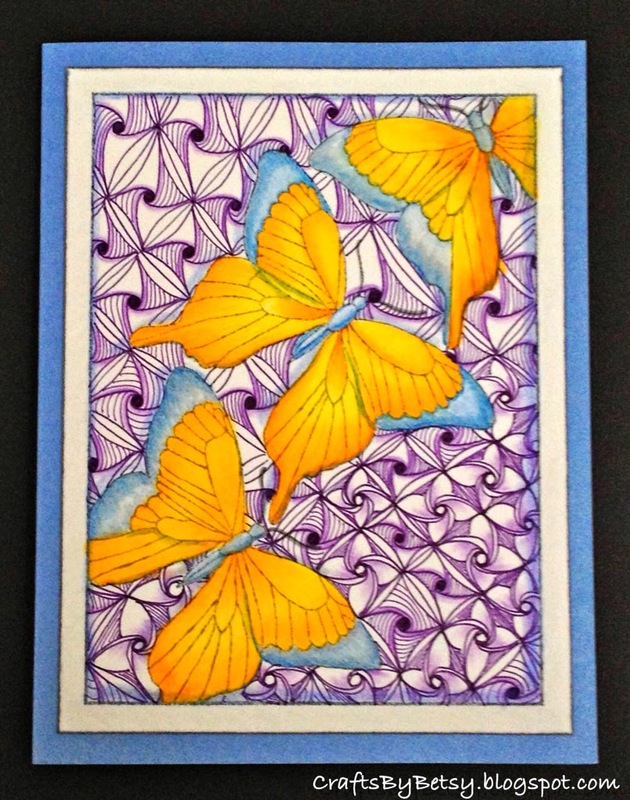 This wonderful butterfly image is Paper Parachute's Three Butterflies. 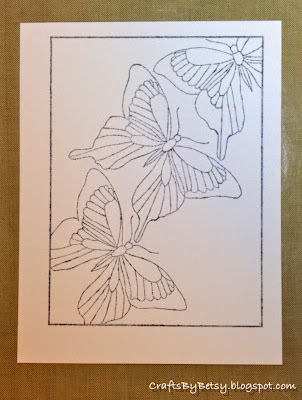 The one stamp includes the butterflies and the rectangle border and is sized very nicely for an A2 card leaving room for a mat. This is the stamped image alone. I used Momento ink in gray flannel on Strathmore Bristol 100 lb card. 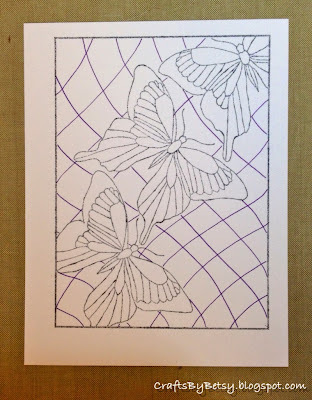 Next I drew a wonky grid using an 01 Sakura Pigma Micron in purple. I added zentangle patterns Well and Yew-Dee using the 01 and an 005 still in purple. 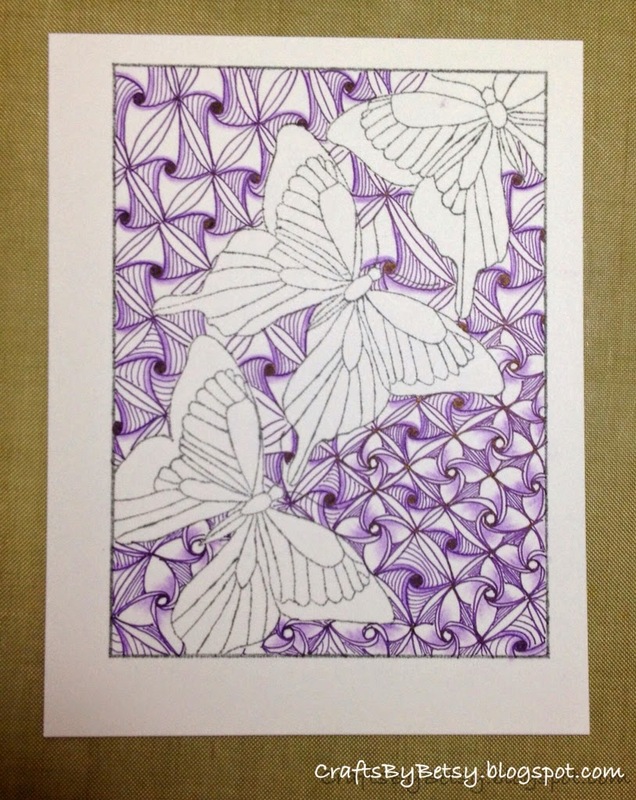 I shaded it with a purple violet Faber-Castell Polychromos color pencil. 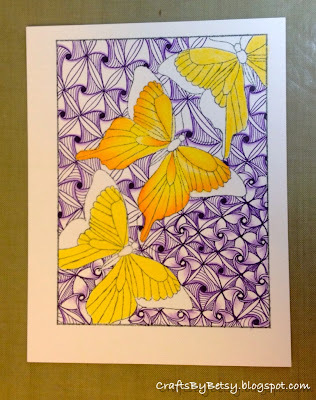 Since the butterflies had all but disappeared, I decided to use vibrant colors and layered several yellows and oranges again with the Polychromos. I've been practicing with the color layering and really found this You Tube by papernlaceprincess to be very helpful. 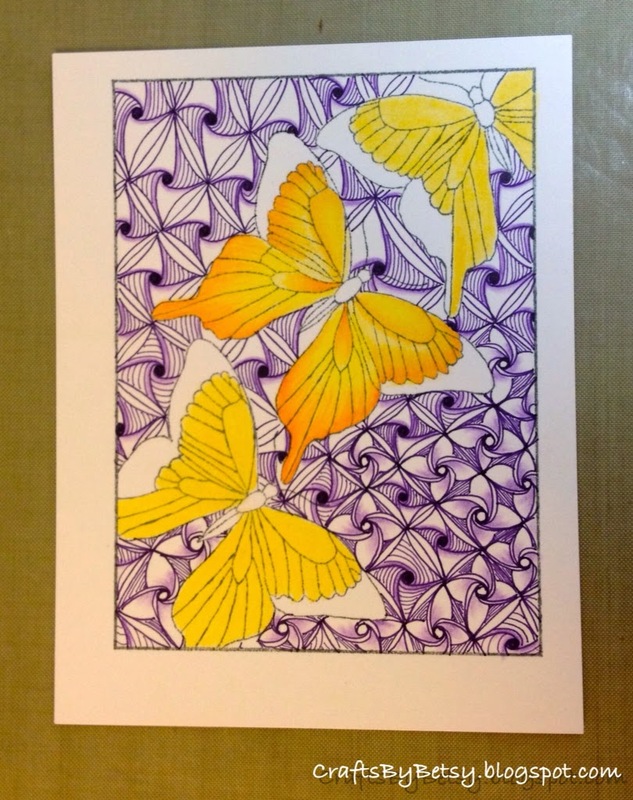 In this photo, the center butterfly is nearly done, but the other two just have the base color applied. When I started, I didn't have a color plan. I routinely refer to a color wheel and this time needed something to tie the colors together yet show off the buterfly images. 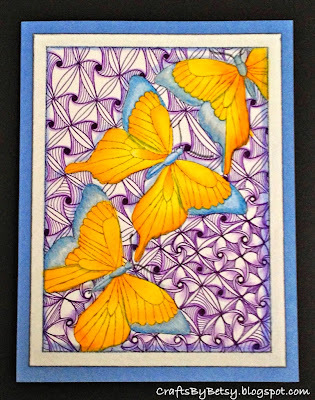 Since I had yellow, orange and violet at this point, I decided to go for the tetrad by adding blue for the edge of the wings, shading and the card base. This is a lot of effort for a card, but a special card is the result. 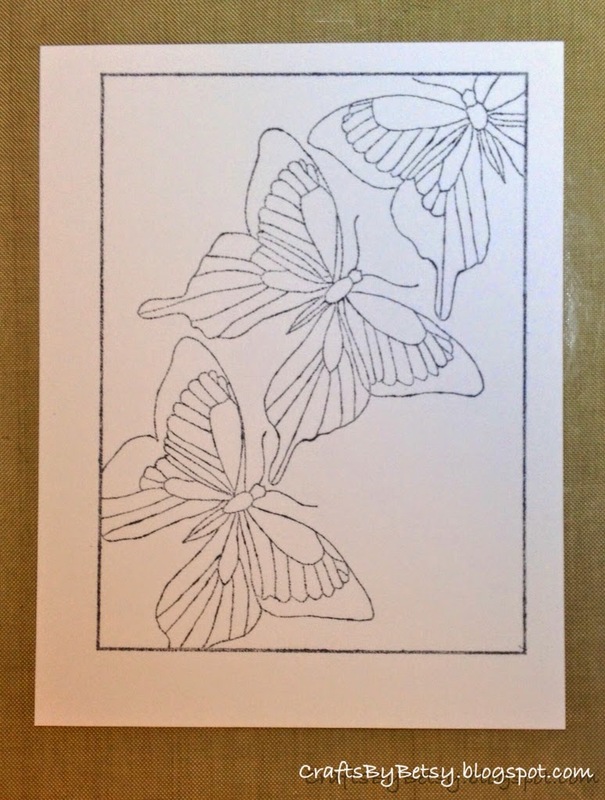 You could choose to mat and frame this for a lovely gift instead, or keep yourself! Your card is just lovely ! I am so glad it has helped you. I have some exciting new lessons on there way and they will be available for purchase in my store. Looking forward to sharing them with you all.